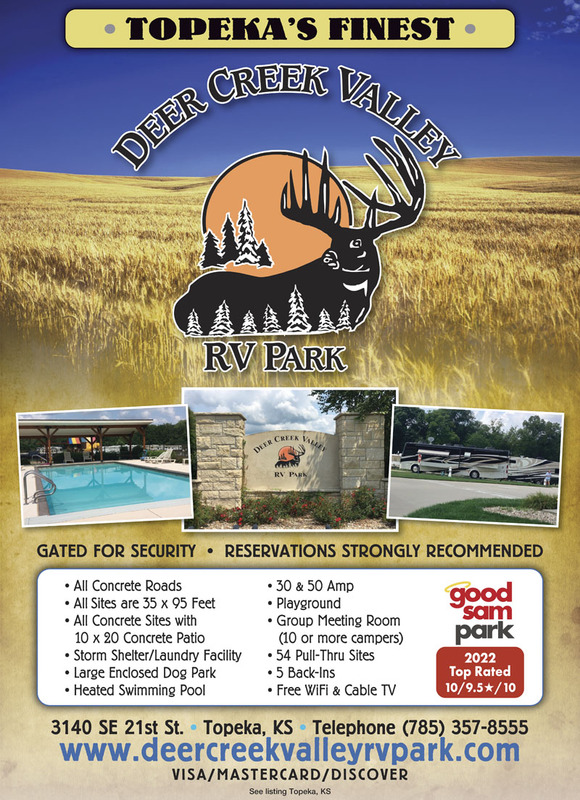 TOPEKA'S ONLY LUXURY RV PARK! Experience luxury tonight! Enjoy our level pull-thru concrete pads with patios just off I-70. Amenities include free cable, WiFi and a security access gate. We pamper pets with a fenced Dog Park. Reservations recommended. 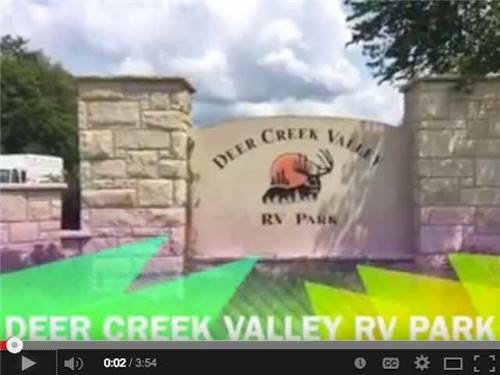 This was an excellent well-maintained RV park for our 33' fifth wheel, with large paved sites and nice amenities at a reasonable price. Staff was efficient and friendly. The park was just off the highway and easy to get to, but the highway traffic noise was negligible when we were there. Close to restaurants. Really nice looking park. Large concrete roads throughout the park. Long concrete sites for any size unit. Large dog park, pool but still not open yet. No supplies in the park office, just a check in but there is a Walmart within 5 minutes. Watch the entrance speed bump it will wake you up. The only negative and it is really hard to say that it is a negative is that there is no shade. We would come back this way and stay with them again. We didn't rate the restrooms because we didn't use them. My husband and I were trying to get back to Mn. but the weather prevented us from bringing our motorhome back so we had to leave it at the rv park. The owners were so accommodating and helpful to us with our problem. We returned 8days later to pick it up and it had been watched carefully and they were extremely reasonable with the rates. We will definitely be staying on our way to Texas and back next year and the years to come! This is a very safe and secure rv park. Also very well kept and clean. We loved the concrete pads too...no mud in the spring! Thanks again for all your help!???? We had traveled from New Jersey to California and were on our way back home when we stayed in Deer Creek Valley RV Park. We called for a reservation first thing in the morning and were glad we did. This was by far the cleanest, nicest and safest park of our whole trip. The driveways are all concrete so there was no mud in the campground after the whole day of rain. The grass sites were lush with no bare spots. There was plenty of dog walking areas and everyone had cleaned up after their animals. The bathrooms were clean and all in good repair in the ladies room. The laundry room was small but everything was working. To top everything off there was a magnificent rainbow over the campground the evening we stayed there. It was like icing on the cake! We enjoyed our stay here. We were disappointed in the wifi. We just could not keep a connection and we were trying to make reservations for future places to stay on our way south. This is a gated, easy access, clean facility. Wish the owners would invest in a better wifi to meet the needs of their guests. We would stay here again. Excellent campground located close off the highway. If you arrive after 6, then you have to call to get them to open the gate remotely. Not a big issue. Level sites with easy hookups, and great facilities for showers and restrooms. Highly recommend the campground. We were on our way to DC and will make it a point to stay here on the way back. Booked 4 nights on the way home to NC from a trip to the Dakotas. Very nice park. Paved roads and sites, spacious sites with grass between, level sites, good bathrooms, convenient to I-70, full hookups with wi-fi and cable TV. There is a gate at the entrance with a code for night time access. Not sure why, seemed to be an OK neighborhood. Only complaint - not a tree for shade anywhere. Weather was warmer than we expected for mid-Sep. Expected that Topeka would be a more upscale town, but sadly the downtown area was totally dead on a Sat afternoon. Maybe everyone was at a college football game. Certainly recommend staying here, but not for 4 nights - not enough to do. The park has essentially level concrete sites with concrete roadways throughout. Our site had full hookups including cable. The space between the roads and sites has finely manicured grass. There is a laundry with 5 washers and 4 dryers in the same building with men/women’s rest rooms. The shower had very low flow (0.6 gallons/minute). The park has an access gate across the entrance that is attached to a 6 foot high fence around the entire park. The gate closes at 6pm daily but tenants are given a access code to open it. The office is closed for lunch between 11:30 and 1:30. About one third of the approximately 55 sites appear to be occupied by long term tenants. There is a dump station on site as well as a swimming pool, children’s playground and an enclosed dog park. As a general rule the wi-fi is excellent but it occasionally drops out, probably due to excess traffic. This resort is amazing! The office staff was very nice. The resort is extremely clean and well maintained. We loved the pool and the concrete slab to park on. The roads were concrete too so my grandson enjoyed riding his bike everywhere. We would definitely recommend it and would stay again! This is a first class immaculately groomed park. Grounds are nearly mowed an edged. All roads and sites are concrete. Restrooms and laundry are current and clean. Cable and wifi work well. Check-in is a breeze. We will stay here any time we are through Topeka. Since the reviews for this outstanding facility weren't recent, I want to add a review confirming the opinions of previous reviewers. The park is extremely clean, sites are large, they have group facilities, and recycling options. The dog park is large and the playground area is very nice. Still too cool for a swim in the pool! The park is easy to find and although close to the highway, the surrounding trees buffer some of the noise. Top notch quiet gated park with paved roads and concrete diagonal pull through pads. Grassy areas between spacious sites. Laundry facility is very clean and up to date. Easy access. We have RV'ed all around the US and have found only a few as great as this one. Super clean and groomed. Beautiful sites and hook-up. Well-designed and beautifully maintained park. Excellent service. Only drawback: would be nice to have some trees. When they call this place a "Luxury RV Park" they aren't kidding! I've never been in such a beautiful campground or RV park. The concrete pads are huge, the concrete "streets" are wide enough to land a private jet and the grass is meticulously maintained. The pool is beautiful and my son had a blast playing on the large playground. The staff is friendly and it is very conveniently located off of I70. I would not hesitate to stop again if I was in the area in the future. The only improvement I would suggest to the owners is to put recycling containers next to the "back" dumpster. Very Clean, sites are paved level and adequately spaced. Extremely nice restrooms. Gated facility and would recommend this location for any travelers. This is a very nice campground. All the sites are concrete and level. The pool looked really nice but it was March and it wasn't opened. The playground area is very nice. 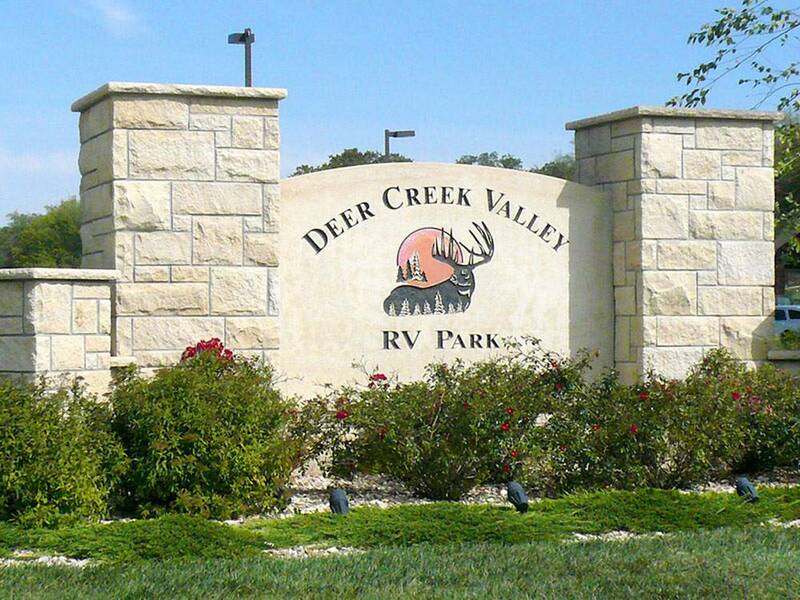 But, the best thing about Deer Creek Valley is the dog park! It is enormous with plenty of grass and well fenced. My dogs just loved it! They could run and play to their hearts content! The park was very clean because the customers that use this campground clean up after their pets! I have only two complaints about this campground: traffic noise from the I70 and a lack of shade. We would definitely stay here again! Excellent park for an overnight or for a month or so. Excellent management. Extraordinary clean. Spacious level, concrete sites with lots of space between sites. Best dog park we have encountered. Great pool, and playground. Gated and secured at night. Plus Lonnie Q's BBQ for lunch or a Friday dinner. Should be rated a 10++. Very, very nice. Looks like a fairly new park. The roads are not even dirty. Nice large concrete pads and grass between sites. The whole place is spotless. I couldn't find anything wrong. The Wi-Fi even worked good. Not very far off the interstate.We arrived before the office closed. If you know you'll be in after hours, be sure to get the gate code.